Netflix's seemingly low-key ongoing rebrand tripped over frustratingly familiar stumbling blocks with The Ballad of Buster Scruggs. Originially conceived of as a series -- and only quite recently announced as a converted feature -- The Ballad of Buster Scruggs definitely bares the surgical scars of the Coen brothers' past indecision. As might be expected, the movie we now find before us is a portmanteau piece made up of six short Westerns that feel a lot like satirical throwbacks to nineteenth- and twentieth-century fiction. That's an impression that's also pretty hammered home, seeing as the film opens on a yellow-skinned, tattered old hardback, written in the style of a ripping yarn, and filled with colourful prints that act as a launching point for each scene. First off, we leaf through the pages to a song-filled story of the fast-drawing, drawling West Texan who gives the film its title. Moving across vast, arrid planes, this self-titled "Songbird of San Saba" (Tim Blake Nelson) bounces songs of his landscape and rides out alone in search of people to beat in poker games and gun duals. He wears an all-white suit, and struts about not unlike a modern-day Cisco Kid, full of lethal rapid-fire bullets, witty snipes and funny turns of phrase. 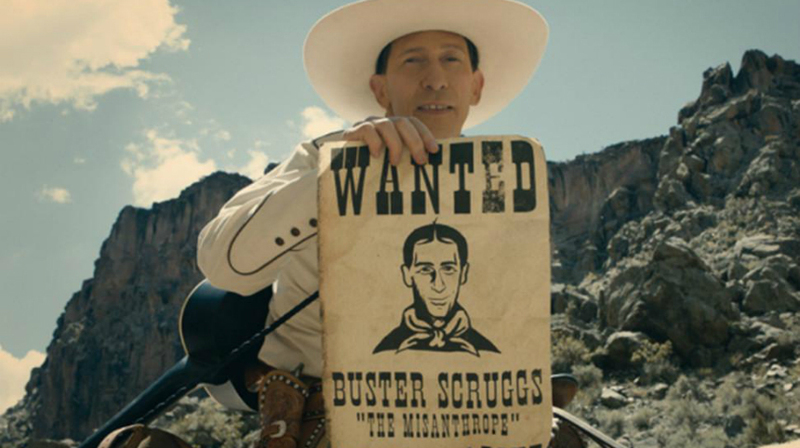 Clearly the Coens' obsession with (and affectionate mocking of) the granduer of Classic Hollywood continues as it did with Hail, Caesar!, but I think I would actually say that The Ballad of Buster Scruggs is better and funnier than their unusually distant last feature. After all, anything satirical by the Coens will obviously have glorious moments of wonder and hilarity. It's just that soon this opening segment is drawing to an end, and you're not sure whether you've something slick, smart and funny or just a bit of an underbaked snapshot. Next comes James Franco in a bank heist sketch that's pretty funny. Pitching himself against a loquacious, eccentric clerk, the straight-talking Franco sets about robbing the middle-of-nowhere establishment - it just most certainly doesn't go down how he expected. Within a very short space of time, you come to realise that people fight in The Ballad of Buster Scruggs with a very Looney Tunes sort of logic, and already the very dark sense of humour that acts as the binding glue for the entire film makes itself apparent. Indeed, each of the film's segments send up quite a different kind of nineteenth and twentieth-century convention or genre, but all are bound by the same sense of the dark maccabre. So when Liam Neeson next arrives as an Irishman travelling in a roving theatre show with an Englishman without limbs, things start to feel decidedly like a Victorian freak show or a darkly themed novella. Whilst the entrance of the great Tom Waits as a frazzled, solitary gold prospector places us in a very different kind of adventure story and atmosphere. But all the while, the main burning impression is how remarkably and comically easy it is to die on the American frontier. Except the problem with the Coens' hotch-potch of satirical homage is that they often perpetuate rather than really criticise things about Westerns that really weren't cool. We get hit by tale after tale of male frontiersmen - to the point where The Ballad of Buster Scruggs almost drags (presumably an unavoidable consequence, when you try to make a series into a film). And you could sit through the whole movie and only see two supporting female characters. Plus, by the time you do get to the tale of one of the women's struggle to survive a wagon train heading West, you'll find a pretty distasteful depiction of Native American "savages," something this film repeatedly uses as little more than a plot device. Beyond this, you also can't really help but feel like The Ballad of Buster Scruggs would indeed have worked better as a series (not just because series have such significantly higher viewer ratings than films do on the platform). Perhaps the Coens really felt that the strength of this movie was its concise bursts of kooky, stand-alone ideas - like a collection of very pure short films. But The Ballad of Buster Scruggs is nowhere near as funny or compelling as Damián Szifrón's Wild Tales, nor is it as outlandish an homage as some of Guy Madden's stuff. It just feels as though each "episode" introduces you to something pretty funny, but doesn't develop that enough or take you on a sufficient journey. Certainly, the film has excellent moments, and hits a particularly nice vein of form in its final act, as greats like Tyne Daly and Brendan Gleeson find themselves in what feels a lot like a haunted ghost story. Really, it just seems as if the Coens panicked or lost steam as they tried to build a series out of what could have been six pretty interesting and distinct, stylised episodes. As a single collection of stories, meanwhile, The Ballad of Buster Scruggs just really doesn't come off, and for the life of me, I couldn't tell you why that title was selected to bundle up all six tales. What's more, it seems like a tragically missed opportunity. As we approach the 20th anniversary of absolute classics like The Big Lebowski, and stand on the mountain of great Coen brother-inspired content like Netflix's Fargo series, it's indisputable that Joel and Ethan's unapolagetically zaney and inspired filmmaking has the potential to completely rock all of our VOD worlds. It's just painfully apparent that this time they haven't. The Ballad of Buster Scruggs is just another only okay Netflix movie that deserves the inferior viewing figures to the absolutely killer TV content that's on the platform. Hopefully, the brothers will be given more chances to get it right in future. And of course, Netflix will have to perfect their original feature content at some stage. They certainly have enough money to keep fluffing it until they finally get it right. Plus, when that time does come, it'll definitely be very exciting, so let's hope that it comes soon. Review originally published during the Venice International Film Festival in August 2018. After a token theatrical release in the U.S., the film is now available worldwide on Netflix.